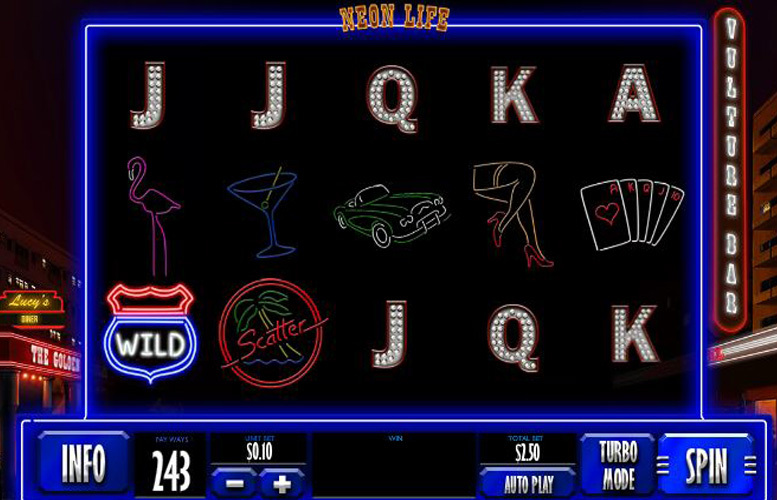 Neon Life from Playtech is an innovative machine that feels great to play. There are some awesome features and the laid back, piano-driven jazz accompaniment really lends itself to the neon setting in which the action takes place. The game itself takes place on a standard five by three game board, and the imagery is that of down-town city life circa 1930. What’s more, there’s an impressive 243 different ways to win, making for a machine that’s lucrative as well as enjoyable. Great style and feel. The symbols, background and music all help create a suitable atmosphere for the game. Innovative game features. Borrowing from slots like Gonzo’s Quest but inverting the collapse function is a nice touch that can get very exciting, particularly in free spin mode. The base game prizes aren’t very impressive. The highest one being tragically small at 100x the coin value. 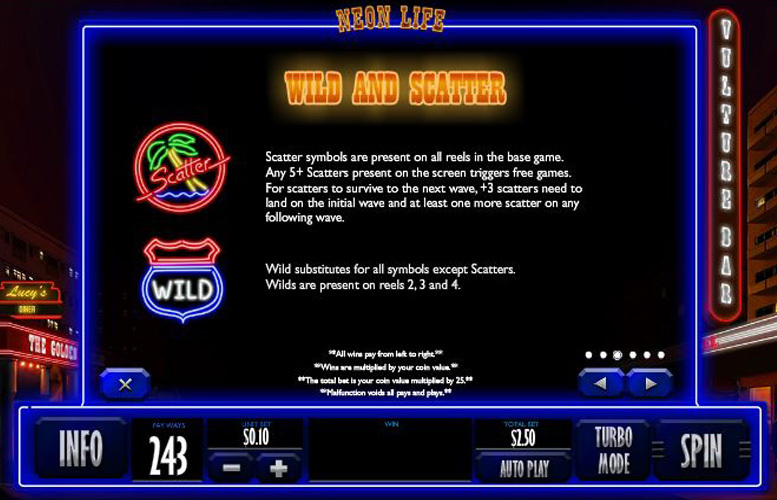 Players have little control over how they can spread their bets out on Neon Life. There is only the option to adjust the size of each unit bet. They are not able to change either the specific number of win lines, or the number of units bet per line. Deck of cards = 100x the coin value. Legs, or motor car = 50x the coin value. Martini, or flamingo = 30x the coin value. If the highest prizes in the game are a bit less than you’d hoped, fortunately, Neon Life has some great features to make up for it. Any win on the reels triggers a collapse. This means that all the symbols participating in a winning combination will light up. Following this, all losing icons disappear and are replaced with new ones. If any new win is possible, then another collapse is triggered. This can continue indefinitely. Scatters are represented by a palm tree neon sign. Landing any five or more of these symbols anywhere on the screen will trigger free games. Players should note: there must be at least three scatters present before any collapse takes place to trigger the free games. The highest number of extra spins is 25, with a dynamic multiplier added too. For every two sequential collapses awarded, the multiplier will increase up to a maximum of 5x. When there are no more collapses associated with a single win, the multiplier returns to 1x. Ace, or King = 20x the coin value. Queen, or Jack = 15x the coin value. As previously mentioned, there are few options for players to mix up their betting size, or how they spread their wager across the reels. Many modern slots allow players to adjust the number of win lines played, or the amount of coins bet per line. 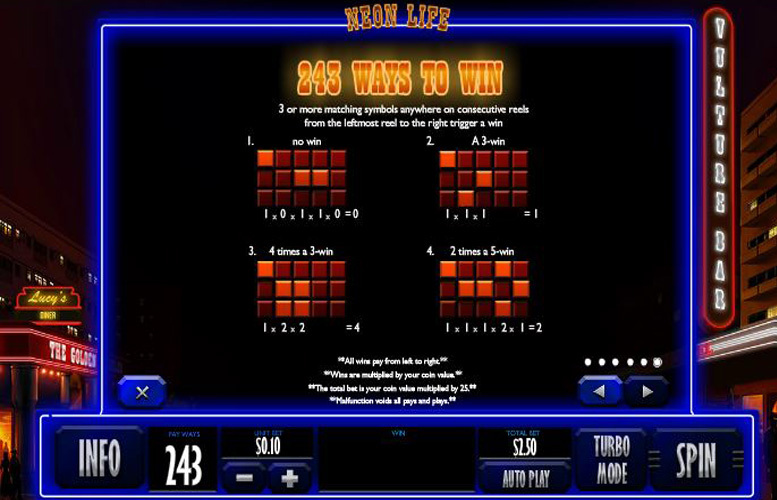 Owing to its slightly different take on win lines (243 ways to win), Neon Life doesn’t allow such variety with bets. This makes the maximum wager possible per spin is £12.50, and the minimum just 25p. All told, Neon Life is a great machine to play. It looks smart, and it offers some good features to keep regular players engaged over the course of longer sessions. Inverting the standard dynamics of “collapsing reels” was a nice touch, and the increasing multiplier can make for some very impressive wins. Unfortunately, there are some things that let this slot down. First, the highest possible stakes are very low. There are some players out there who want to be betting hundreds of pounds a spin, and this just isn’t possible on Neon Life. In addition, the lack of customisation of bets, and the low base game prizes do hurt the enjoyability of the game. This game has a rating of 3 / 5 with 321 total reviews by the users.